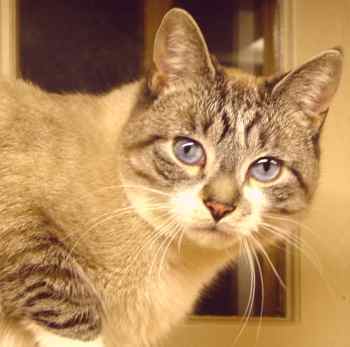 "Ernie, adopted as a 10-week old kitten in June 2002, is now a beautiful Lynx Siamese mix with a wonderful personality. He loves to give kisses, sleeps with us most nights and is a bundle of energy. With his long body and legs he walks like he weighs 50 pounds----you can hear him coming a mile away!" Ernie is now joined in the household by Duke. David and Krista write, "Here is a picture of our four kitty angels, from top to bottom: Rudy, Olivia, Oliver, and Clarisse. "We adopted Rudy (from triplets, the other two were Ruby and Cherise) in August 1999 along with Clarisse. We suspect Rudy was about four months along with her two sisters when we adopted her. We also adopted Clarisse at the same time we got Rudy. Clarisse was two years old at the time. "We adopted Oliver and Olivia in October of 2000. They were presented as brother and sister because of how small they both looked but it turns out that Olivia is the Oliver's mother. Oliver was about sixmonths old at the time of adoption and Olivia was about two years old based on her teeth. 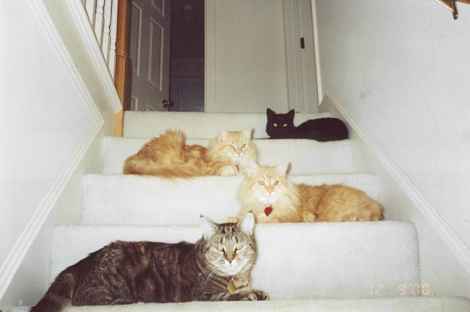 "This picture represents the pecking order of the house, Rudy the princess and smallest of the four rules the house. They were already seated in the order of the picture, I just had to run to get the camera, it was too good to pass up. If you know cats, having four stay in one spot for a picture is impossible so we were lucky." Marianne and David write, "We named her Minerva McGonagall (owners are fanatics of Harry Potter) and we are happy to report she's a sweetheart. Never have we met a cat possess such sweet temperament or such beautiful green eyes. "The first two days and nights she took residence behind the washer and dryer, refusing to come out. So, we waited patiently until she was comfortable in our presence and within the week she allowed us to pet her and sit next to her while she ate or groomed herself. Now when I come home from work, she's usually waiting for me on the stairs and demands that I play with her for at least twenty minutes before relinquishing me to housework. 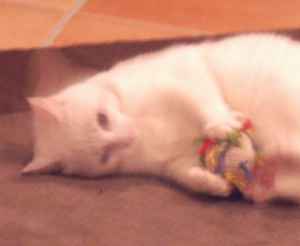 "Thank you for rescuing Minerva and allowing us the chance to adopt her. She's added immeasurable amount of joy in our hectic lives." 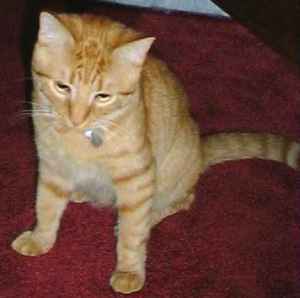 Angela and Lee write, "We adopted an orange tiger in February 2000, after our single cat became aggressive. 'Ned' was only 13 weeks old at the time and we felt that he needed a more dignified name, so we decided on Figaro. He is a shy enigma, and we often call him 'Figgie' or 'Fig Man on Campus' as he rules his world. "He loves to have his back rubbed really hard, and will move down until your hand is just where he wants it, then he will turn over to have his belly rubbed. But it must be on his terms, so it is a gift from him. He and Galileo get along well and will often be seen grooming each other. We are very thankful to Kitty Angels and we love having the 'Fig-miester' here."